Pre-event planning Surrey-based software provider Advanced Business Solutions holds an annual user conference to update customers on the latest product developments. The event is also an opportunity for customers to network and share successes and ideas on how they are using the software. 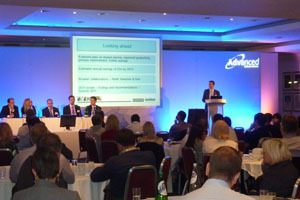 The conference has been running for four years, and each time it takes on a different theme, with last year's event on 'Achieving Advantage Through Collaboration' aimed at those working in the public sector. Advanced Business Solutions emailed its customers before the event, asking for their expectations and input, so they could have a say on the agenda. Challenges Delegates were travelling to the event from across the UK so the venue had to be near good transport links. Cost was also an issue in the current economic climate - while the event was free, delegates had to pay for accommodation. "This ensures that we keep costs as low as possible but at the same time enables us to maintain a high level of quality," says Michelle Wilding, senior marketing executive at Advanced Business Solutions. The company also wanted cabaret-style meeting facilities, to provide a comfortable setting for delegates taking notes. Solution It was key for the venue to remain within the Midlands, due to its central location and good venue rates in comparison to the south, so the event was held at the Crowne Plaza in Nottingham. The event took place over one-and-a-half days with the main presentations on the first day, followed by sector-specific break-outs and partner sessions on the second. A number of solution business partners also exhibited and presented at the end. Post-event analysis A debrief was held after the meeting, with a post-event report circulated to both the conference committee and the management team. "We were very happy with the event overall and customer feedback was excellent," says Wilding.